INQUA has established the Sir Nicholas Shackleton Medal in recognition of the many contributions of Nick Shackleton, a giant in the field of Quaternary science. The medal will be awarded once every four years to an outstanding young Quaternary scientist, chosen by his or her peers and evaluated by a blue-ribbon committee of distinguished scientists. The medal, INQUA's first, honours Nick's distinguished career in Quaternary geochronology and paleoclimatology, which spanned 40 years and was based on isotopic studies of deep-sea sediment. Shackleton was showered with honours by his peers and the wider scientific community, thus a medal in his name seems appropriate and necessary. Nick served INQUA for 12 years, first as a Vice-President, then, from 1998 to 2003, as President, and most recently as Past-President. INQUA invites nominations for the Liu Tungsheng Distinguished Career Medal, first awarded in 2011, which recognizes outstanding service to the international community in Quaternary science. The medal will be awarded at the INQUA Congress to be held at Nagoya, Japan in 2015. 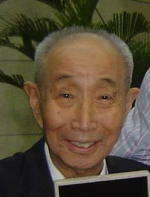 Professor Liu, a former member of the Chinese Academy of Sciences and research professor at the Institute of Geology and Geophysics, Beijing, China, made outstanding contributions to Quaternary paleoenvironmental research, particularly with respect to Chinese loess sequences. He had a long record of service promoting Quaternary research and provided significant leadership to national and international Quaternary organizations. The Liu Tungsheng Distinguished Career Medal will be awarded to a senior Quaternary scientist who has made numerous, distinguished, and significant contributions that have clearly advanced Quaternary science through service to the international community. The INQUA Distinguished Service Medal is awarded to individuals with a recognized record of sustained and outstanding contributions to the maintenance or development of INQUA’s important functions (e.g. organization, operations, outputs, publicity). It is envisaged that candidates will have completed their service to INQUA at the time of their nomination.